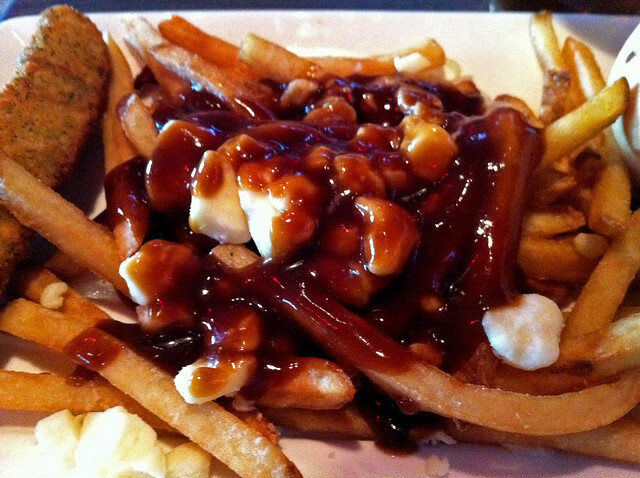 A frustrated Manitoban's search for the perfect poutine in Manitoba. Eating plate after plate of slop with shredded cheese until that perfect poutine finally appears! It's been quite a while since I've last done a poutine - since the March 13 review of New York Fries' poutine. Today's review would have been dedicated to Smokes, but as they kept changing their opening date, I decided to stay in Brandon. 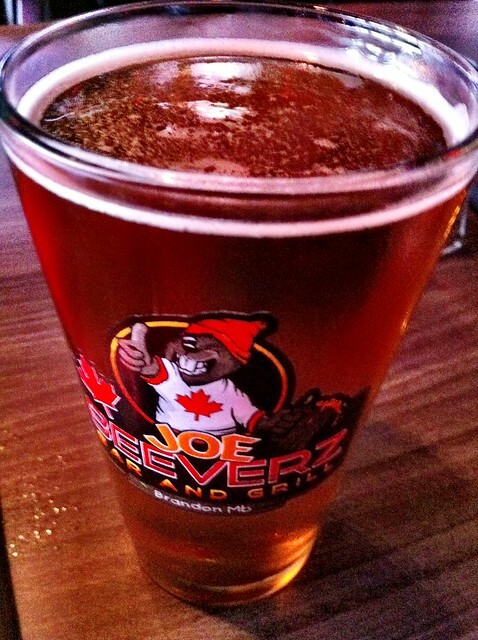 To my luck, the new Canadian themed pub Joe Beeverz Bar & Grill opened in my hometown of Brandon, Manitoba today. The idea of a Canadian themed pub is intriguing to me, but seems more like something you'd see outside Canada, but never-the-less: I loved the idea. 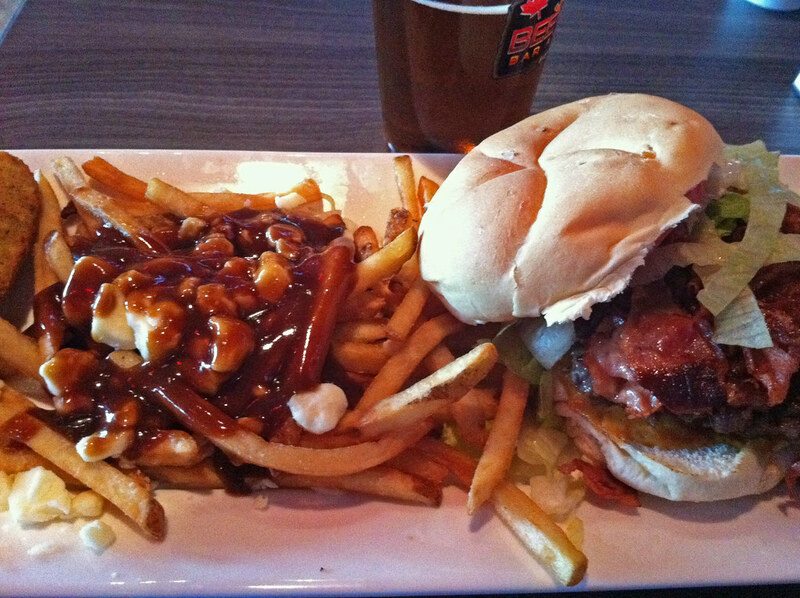 This review will be more than just the poutine, for something different, but I have the poutine review first. On their menu, they offer two variations of poutine, first off - the Lobster Poutine. I'm not a fan of lobster, but the second one is the regular Poutine. In the menu they list it as having "real cheese curds and gravy." They have it simple and right to the point, while other pubs will describe the poutine in detail, but not state what kind of cheese they use. I knew I had to come here just to try the poutine. How was it? I quite enjoyed it to be honest, it wasn't piping hot/fresh, but it was quite enjoyable, easily one of the best poutines in Brandon, if not Manitoba. The fries were a bit thin, but were nice and crispy, and had skin-on. The fries sure did its job as the gravy and curds are added, giving it a bit more structure. Some fries are usually quite soaked and soggy and don't react with the curds/gravy well - this is not one of them, thankfully. Gravy - it appears to be a darker beef based gravy, but I could always be wrong. At first I thought it was going to be more of a club house packet style gravy but nope - I was wrong! It's a very respectful gravy, although it could have been a bit warmer as it was only a bit warm. That being said - I don't like scalding gravy on my poutine. The curds - wow, they used curds! For a non-chain restaurant/pub in Manitoba, this is a truly a rarity. I'm not too sure what sort of curds they use, it could very well be Bothwell, but the size of the curds were perfect for the poutine, nothing too large/small to make things difficult. There wasn't the rubbery squeak when biting into them, but that's expected here in Brandon. Overall, a very respectful poutine. I'll certainly be getting it again. The atmosphere at the pub was a bit of a shock to me, I expected just your regular prairie style pub, but it's quite elegant for a pub. On one wall they have photos of Canadian celebrities, on another they have framed jerseys by players such as Wayne Gretzky. I was surprised that they're open on Sundays too, as generally Sundays are a more relaxed day in this Wheat City. They have a few beers on tap, just the usual Molson, Rickards, Kokanee, etc, but they also have a beer specially brewed for them called the Bucktooth Brew Amber Ale. It was actually quite a nice beer, it had a bit of a hoppy aroma, not too much for the average beer drinker here, and the taste was similar to that of a Fort Garry Dark Ale to a point, and lesser so a Big Rock Traditional Ale. I was hoping they'd have a few varieties of Winnipeg's Half Pints on tap or bottle, but they don't, but the Bucktooth will likely be my go-to beer whenever I return. I obviously ate too much there. I tried their Rink Burger (see top of article for photo). Anyone growing up in rural Canada knows exactly what a rink burger is. I got mine with bacon and barbecue sauce. They probably put more bacon on that burger than I've ever seen, that was a lot of bacon. I really enjoyed the burger, it was thick, juicy, more than filling - I almost couldn't write my poutine review because of it. The one thing I didn't like about it was the chopped onions in the sauce, I guess next time I'll just ask for it plain. I just detest onions. The burger actually reminded me of this one little restaurant I used to visit in Quebec City that was known for their burgers, they must have had 12-14 different varieties of burgers, oh memories! With each platter, they give you a deep fried pickle on the side, which I found funny. Lastly, the final course had to be dessert. I tried their Snowshoe, which is their equivalent of a Beavertail. 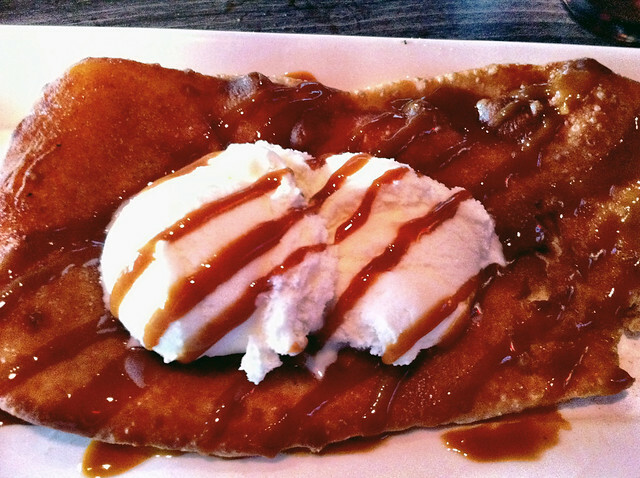 Fried pastry drizzled with caramel sauce and topped with ice cream. This brought me back memories of being on the Plains of Abraham for Canada Day 2008, it was absolutely delicious and I can live without having another Beavertail for at least a few days. All in all, I was quite pleased. I'm paying back for it right now, my stomach is still sore, but it was worth it. Real poutine in Brandon, that's all I can ask for, really! now I know where to go next time I find myself in Brandon, thanks ! Copyright 2011 - Poutine.me - vive la poutine!. Powered by Blogger.